Dog Days are upon us and I hadn’t heard many great reports from the White’s lately so decided to head up and check out the new fishing shack. Dragged Daryl along for some always entertaining talk and headed up. Mainly wanted to see just how long a drive it would be and how much the gas costs would be. Ended up I can get there faster than I can get to the SJ and with a couple guys splitting gas and no motel fees it is an easy trip. The shack is not really mine yet but the outfit was gracious enough to let us stay there before actually closing on it….sweet! Dog Days are Dog Days everywhere but at least at this lake you can have a day where you catch a couple dozen fish up to 22″ and pushing 5 lbs. It definitely was not the lights out trip we had a month ago but after figuring out what the fish wanted we had our way with them pretty good. The area we hammered them in last time still held the most fish in any area we found but we just could not get them to play consistently. The lake had a pretty good bloom going on and this had to affect them. The area we fished had a stream entering with pretty good flow and plenty of callibaetis hatching in the evenings. The bigger fish would slurp up the spinners early am and then hit them again at the hatch in the evening. If the wind was down we sight casted to them but mostly we fished subsurface with callibaetis emergers, scuds and simi’s. Didn’t take many pics this time but got one of Daryl with a not so fat 22″r. 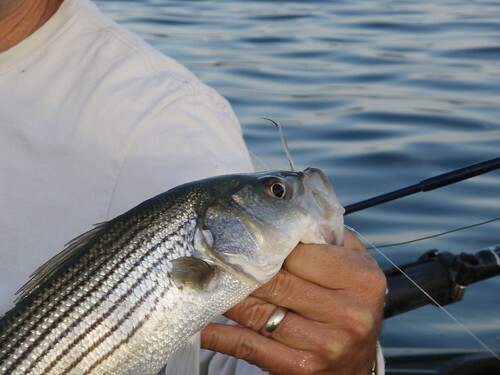 The lake is going to be awesome this Fall with fish up and over 5 lbs cruising the shoreline. It was going to be hard to better last years trip around the West. I headed out to meet up with Micah on Thursday evening with 11 days of fishing ahead of us. An airplane delay for Chad made for 12 hours that seemed to last several days for Micah and I. After getting Chad from the airport, it was off to Geoff’s place for some ice cold keg beer and Leg 1 of our journey. After an undisclosed length drive to an even more undisclosed location we arrived ready to see if the Bull Trout were waiting. Chad got me into this sport 16 years ago when I met him in college in Erie, Pa we had not had a chance to fish together in almost 10 years. This was also Chad’s first trip out West fishing. As a special welcome to the West, Chad got the biggest Bull Trout of Leg 1 a 10+lbs hog. To say Chad was impressed at this point would be an understatement. This year produced even more big fish than last years outings, so we were all pretty pumped at this point. After a couple days of running with the Bulls, we headed back to pack all the necessary gear for 5 days of base camp at Henry’s Lake. We arrived to a 30 mph wind that would hang out for just about every day we were in the area. Day 1-Decided to head out in the morning on Henry’s and try our luck. Heard rumors of fish stacked up by a spring about a 45 minute paddle away. Took to the oars and got our spot in the flotilla. Landed a couple of fish, but it was pretty slow. After that we headed out for some grayling in some small streams. We got out of the car and were ambushed by the biggest swarm of bugs I have ever seen. Not the bugs we were looking for either, the biting kind. We cowboy’d up for about an hour and Micah caught a couple of fish, we were just glad to get out of there alive without the West Nile. Day 2-We decided to check out some new water at Wade Lake. I have never seen a mountain lake so clear. Micah hammered them here catching a couple dozen fish, I got about a dozen, Chad managed to get a half dozen or so Nothing big though, most fish were in the 12-16″ range. We hit a small stream as well and got some nice cutts up to 18″. Day 3-Yellowstone NP day. Chad had never been into the park, so we decided to take a 100 mile loop through to see some scenery and hopefully catch a few fish. We fished the Madison, Gibbon, Lewis, Yellowstone Lake and Rivers. Nothing on the lake or Lewis, we all managed to catch browns on the Madison and Gibbon in the 12-15″ range. We did not spend much time on the Yellowstone, but Micah and I both landed Cutts over 20″. No pictures from this leg, overall more driving than fishing on this day. Day 4-We decided to head back into a little hike in lake in the area to see if it was as good as last year. It was. I landed over 40 fish during the most amazing Callibeatis hatch I have ever seen. Micah fished mostly dries for 25 fish. Chad, still learning the ropes of lake fishing, was into double digits pretty easily as well. A beautiful lake with many eager rainbows in the 15-20″ range with some bigger ones in there for sure. Day 5-The night before in camp we had heard about 3 10lbs fish being caught out of Henry’s. We decide to take one last shot on Friday morning. As you may be able to tell by some of the photos Chad is a guy who likes a good workout. 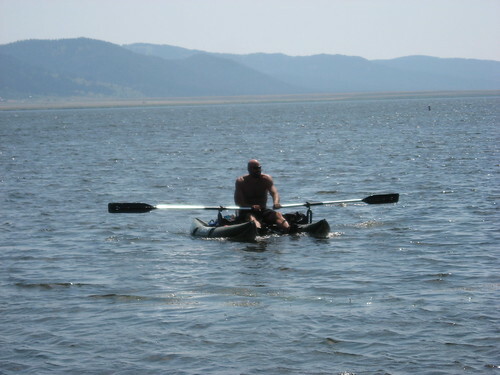 He decided to row across Henry’s Lake and back, which is about 9 miles. Micah and I opted for the 1\2 mile paddle. We got into them a bit, I got 7 fish in a few hours which is good for me on Henry’s. Micah landed several and shots as several others. Chad accomplished his goal and is the only one I know who has ever rowed a pontoon across Henry’s. The wind really started to howl around noon, so we decided to give the grayling and Cutthroat one more shot, hoping the wind would keep the bugs away. It was pretty slow at the stream, but I got to one stretch and things went crazy for about 5 casts. 18″ grayling, 16″ grayling, 21″ cutt, 15″ cutt, 14″ grayling in 5 casts on the cicada. I was hollering for someone to come and take a picture, no one came, but managed to get a few pics of them. It was an awesome way to end Leg 2 of our trip. After a good watering at Trouthunter’s that night we hit the road home for Boise, with a stop at the Big Wood. We all managed to catch a few browns at the Wood and we had some shots at some big fish, but could not connect. We were fishing in the middle of afternoon and the water was skinny. Oh well, 1 day left for the Grand Finale. We finished up on the Owyhee in Oregon. Same old, same old with a nice surprise to end the trip. After already catching the biggest grayling and Bull Trout of my life why not add the biggest brown. Micah’s fish was caught on a hopper and was 22″ for reference. We estimate mine to be 27″ around 7 lbs…caught on the last cast of the trip. The bell rings a little after 8 this morning to announce the beginning of our son’s second grade education. Summers always went fast as a kid, but they are even shorter these days. Combine this with an otherwise busy schedule and it results in not a lot of fishing over the recess. So when he and the wife stopped by the shop on Saturday, I asked him if he wanted to go fishing on Sunday as a last fling. When I got home from work, he had his stuff already packed and a rod next to the door. I guess the apple did not fall far from the tree. One nice thing about living in Phoenix, Arizona is that in 90 minutes you can be fishing in the pines. We fished Tonto and Christopher Creeks until afternoon storms chased us out. Often I fish the standard dry dropper set up for plunge pools and riffles; streamers for the deeper holes. Not a single fish took the dropper yesterday which is unusual. With the dropper rig, all were caught on top with the size 12 Wulff indicator. Simi seal leeches in crawdad also produced on the swing or with a hand-twist retrieve. Study hard kid. There is no reason we can’t break for quick trips like this now that school is in session. Hit the road with Daryl for his family reunion and a little fishing in Utah at Panguitch Lake……16 days later I rolled back into the valley with a big gas bill on my cc card but a whole lot of good memories of some great fishing with good company. We managed to hit 10 different lakes and 4 rivers. Usually I am ready to head back home after about 5 days of fishing. I wasn’t ready to come home at all this trip. I even made a down payment on a little fishing shack on Panguitch Lake, so I guess I’ll be seeing more of Utah in the future. The lake has a slot limit to insure big fish. So that told me there will be a future with the fishing. Anything 15″-22″ has to go back so that means you catch plenty of 20″+ fish and they are hard fighting rainbows and Bear Lake cutt’s. The lake also has tiger trout but we didn’t get into them this trip. Something for me to work on in the future (for sure). We headed for Henry’s after three days at Panguitch and fished the big hybrids and cutt’s for five days. Never really got into the big guys like in the Fall but we’re sure we had a few on that just kept on going. Landed lots of 3-51/2 lb hybrids and cutt’s fishing small simi buggers in deep leech. Fish really keyed into that color and using something else really slowed the bite. Found that really interesting. After five days and no real plan it was decision time. Montana was blown out so we headed south. I was anxious to try some of the lakes that Daryl had told me about many times so I was excited to head towards new water. While still in Idaho we hit Blackfoot Reservoir trying to find some of the big spawner cutt’s that head up out of the lake. We fished the river above the lake trying to intercept them on their return trip. Lots of pelicans at the creek mouths so we knew we were at the right spot but just couldn’t connect with the big guys. The highlight of this lake was the BIG carp we got into on the lake. These guys would feed in the shallows during the night and then cruise back out into the depths as the day wore on. We sat out in our kickboats and intercepted them on their way out. Talk about explosive! Imagine a 23 lb carp hitting a fly just under the surface 20 ft from your boat. It was awesome! These fish would track your fly and if it didn’t look just right would turn at the last instant….leaving you sitting there with your mouth open….WTF! We did manage to pick up 5-6….the biggest three went 18, 19 and 23 lbs. Off to Utah. I was anxious to hit some of the lakes I had heard Daryl talk about so many times. Scofielf, Chesterfield, 24 Mile, Minersville, Forsyth, Otter Creek, all had nice 2-3 lb rainbows and Piute gave us a nice day of smallie fishing. We landed 40 each with several nice ones. We fished the Sevier below the lake as well and Daryl figured it out and had a good afternoon landing 5-6 nice rainbows up to three lbs. I landed a handsome 4 lb sucker for my efforts (yes, I heard about it from Daryl that day). We ended our trip back at Panguitch and found a honey hole that yielded us probably 40 each…..hard to leave that behind, especially when I heard it was 110+ back home. I know where they are now though and if everything goes as planned….I will have a shack close to it all. Next time, can’t wait!!! 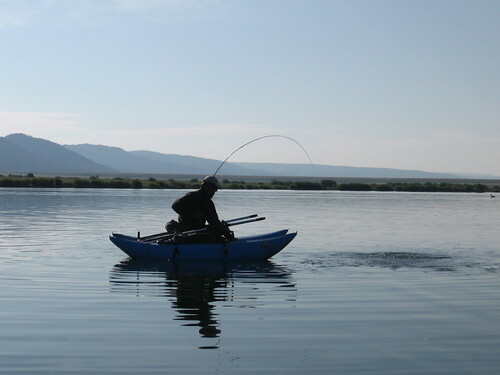 Nevada is not the first state that comes to mind when one thinks of Fly Fishing. It is a state that one drives through on the way to the more famous waters of Montana, Idaho, Oregon and Washington. On one of those drives home last year I looked to the West of US-93 and saw the snow capped peaks of the Ruby Mountains. I then started to research some possible fishing places when I arrived home and finally got a chance to meet some friends from Idaho to check them out. We left Phoenix at 4 in the afternoon with the hopes that we would be able to find some fish. 11 hours later we arrived at the Ruby Marsh just as the light from the rising sun was becoming visible on the horizon. The Marsh is a huge wetlands and National Wildlife Refuge. There is a large Collection Ditch which are spring fed from the Ruby Mountains. There are also many “ponds” and a bigger main lake area is at the south end of the Refuge. I had talked to a person at the Hatchery the week before and he had warned that the fishing had been poor at the Marsh due to some improvements they were making at the Hatchery. After the all night drive we were just happy to stretch our legs and confirm that the fishing was poor. JG and I walked the Collection Ditch for a couple hours and we did not spot a fish. Beautiful area, but just did not see any fish working in this shallow water. At that point we decided to head up the road to check out a different spot. We headed up to Jiggs Reservoir and found a very shallow weedy lake. There were a couple campsites that looked promising, but for 7 A.M. we expected to see more rising fish. We could always come back to it, but with some good reports coming out of S. Fork Reservoir we did not waste anymore time and headed up the road a bit further. When we arrived at S. Fork we were a bit intimidated, it is a big lake. As we started to make our way around the shoreline our expectations were pretty low. We were up for 30 hours straight and had found a couple spots that were less than desirable. As we made our way around the lake we found a little road and decided to see where it led. 5 minutes later we were on the West shoreline in a promising spot to spend a few days. We also saw some 20″ trout cruising right in front of camp. Things were definitely starting to look up. We had to meet up with Rawdy and Micah so we headed back to the main highway and when they arrived we led them back to home for the next 4 days. We made a quick camp and within a minute of entering the water I had fish on. It was an extremely strong 18″ rainbow. Game on. All night drive was worth it!!!! The next 4 days were just awesome. We estimate we caught well over 200 fish between the 4 of us. Micah was on fire and had a 40 fish day on our second day. A mixed bag of smallmouth and rainbows. The smallies were cruising the shallows and sight fishing was the way we got most of them. The trout were feasting on the many chironimid, damsel, dragon and mayfly hatches. We caught fish on so many different flies, but Micah with the Denny Rickards stillwater nymph proved to be the most effective. We did manage to take some fish on top with frog patterns and dragon flies. Most of our rainbows were in the 18″ range with fish landed up to 4 1/4 lbs. The smallmouth averaged about 14″ with fish up to 3 1/2 lbs taken. Many of our fish were taken with a couple hundred feet of camp which was a nice bonus. Here are the pictures of the Rainbows. These fish pulled HARD and were jumpers. Our backing was exposed several times and multiple jumps from almost every fish. The smallmouth were cruising all over the shallows, appeared to be in post spawn. Sight fishing for these fish was a blast. Our biggest came on an Adult Dragon Fly. We also checked out the S. Fork of the Humbolt below the dam. There were Wipers and Smallies cruising in the pond below the spillway that were very spooky. JG fooled a smallie, but the wipers did not want to play. The river was running high and fast, but Micah landed a very nice 3 lbs cutbow. What a trip. The slow start at the Marsh and Jiggs had us worried, but we found some great new water and some awesome fish. There are several other places in the Elko hub that need some checking on, can’t wait to get back to the area and do some more exploring. Rawdy, JG, Micah and I had so much fun and laughed about half the time we are there. The best buddies are fishing buddies. I had a chance to get out and fish the Black once in early May and a couple times so far this June. The water levels are starting to get back down to their normal levels and the fishing is really turning on. A couple photos of the many antelope we have seen this year on the drive in. I headed out with JG and Ken in early May to check out water levels and see if any smallies had moved into our favorite spots on the river. The water was flowing high at 250 cfs and we did not see any smallmouth yet. We did however find some nice browns. I had one on and close to landing that had to be over 4lbs, but it will remain the one that got away. I did manage a beautiful brown that went about 17″ and Ken landed a nice rainbow about the same size. The normal shin deep water was about waist deep and the water was still very cold. I gave it a few weeks for the water to drop and warm, as well as waiting for our friend Mr. Smallie to show up. On Sunday June 1st I headed down again with Josh Owens. After a rough hike in we found more conducive water levels and smallies all over the shallows. We each landed 15-20 smallies in the 1-3lbs range, mostly sight fishing. A great day on the water. The fishing was so good on Sunday that I just had to go back on Weds 6/4 to do it again. I headed out this time with Jeremy, JG and Brent. Brent and Jeremy had only been to the Black once and I was excited for them to see it when it was on. They hammered them, 24 for Jeremy and 21 for Brent. JG and I managed to add another 40 fish or around that for a total of over 80 fish between the 4 of us. I was into the sight fishing the shallows, but Brent managed to catch many of his fish on a bugger in the deeper pools. The flows were at 80 cfs which is about 40 cfs higher than normal for early June. All in all it has been a very productive Spring on the Black. I do not mention specific spots on the Black as there are over 70 miles of fishable water and taking the exploration out of it will lessen the experience. Go explore this great watershed and enjoy!!!! Well I finally got a chance to get out and chase some Saltwater fish on the Fly. Those fish are pretty cool and they do pull hard. Roosters can be a very frustrating fish, but when you hook one it is well worth the effort. John, Zach and Jeff were very patient with the rookie and I learned so much. I am looking forward to my next shot at some more Saltwater action. Day One-We got picked up at our place on the beach and rolled north in the boat to find some bait and hopefully some Roosters. Within 15 minutes John had one on in the other boat. Within an hour I got my first fish on the Fly in Salt, a 3-4 lbs Ladyfish. After another couple of Ladyfish landed, Zach hooks into something and his reel starts screaming. A few minutes later he brings in a 6 lbs Sierra Mackerel. Check out the chompers on this fish. After that we headed out to a different spot to try and find some Roosters. We pulled up behind the Giggling Marlin and found a large school of some smaller Roosters. The next hour was awesome. Hooked 6-7 fish landed 3, Zach probably caught as many or more. It was really cool to get into them that quickly, I thought it was going to be easy at that point, the next couple days showed me that it was anything but easy. After that we headed out for some billfish, had a Marlin come up, but it would not eat. Just an awesome first day, it was hard to sleep that night as I could not wait to feel the tug of those fish again. Day 3-John and Zach were messing around on the beach before the boat came and within 5 minutes Zach hooked into a ladyfish. It must have been the saltwater version of the first cast curse, because we did not catch another fish the rest of the day. There was some illegal netting going on the night before as well as a full moon. None of the other boats did anything either, we had some close calls and I pulled the trout hooks set out for 2 fish, which we probably would have hooked if I did not pull the hook out of the fishes mouth. All in all a great trip. I wish I would have caught a few more, but learned so much and will be much more prepared for what is happening next time. Thanks to John, Zach and Jeff for their patience. The place was sweet and Jeff took us out for some great local food. Zach and I spent a decent amount of time walking the beach, but it was just a little too early and the big schools were not in yet. I can’t wait to go back. Started on Earl Park Sunday morning. Saw some shop customers at the launch as well as a few risers. Headed to the backside of the lake and picked up a few small rainbows on midges about 8-10 feet under an indicator. The others on the lake were picking up some fish here and there on buggers and Simi Seal Leeches. Emerson showed up about an hour later and it was good to see and fish with him again. He hooked 4-5 fish pretty quickly. It slowed down for me for a bit, but then I saw a riser, kicked over to it and caught my best fish of the couple days I was up there, only 16″ inches though. Headed over to another spot on the lake and landed a half dozen 8-10″ fish with one decent fish at 15″. After talking with Emerson a while at Earl Park and having some lunch, I decided to go check on the Greer Lakes. All these lakes are full and the water looks good. Was going to hit River, but the wind was howling. I put out on Bunch and caught 6 stockers in an hour, all 8-10″ bows. Set up a quick camp and decided to go check out the Dam at Sunrise to see if anything was happening. Emerson mentioned that there had been a couple reports of the bait guys catching some nicer rainbows at the dam. No official word out on if the lake had winter-killed so I figured it was a good way to kill an hour before the sun went down. Saw pods of tiny fish and an endless amount of risers at the dam. Hooked another 4 fish there, all small Apaches that looked to be recent stockers. Monday I decided to check on River Reservoir with no wind as I heard there had been some nice Browns that came out recently. Spent an hour on the lake with not as much as a bump. I also saw about 100 cormorants(sp? Big ugly birds) in the trees there and only 1 fish rise. With all the great reports about Becker, I bagged it and headed down the road. Becker was good until the wind came up about 10ish. Caught 4 fish all good size and strong fighters. Got 2 on Simis and 2 on Zebras. I think we are still a couple weeks away from Prime Time in the Whites. It was not as good as last year at this time, but much more water up there and just taking a while longer to warm up.